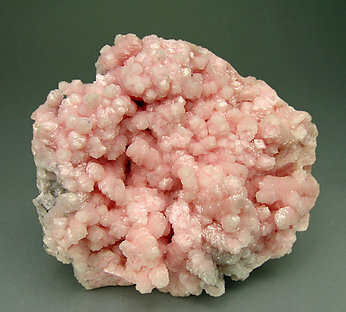 Spheroidal aggregates of white rhombohedral Calcite crystals on a druse of rhombohedral Rhodochrosite crystals with good color and very pronounced curvatures, forming the habit well known as "saddle crystals". 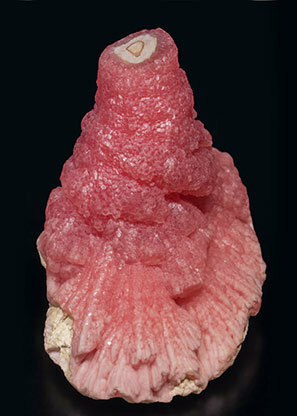 The sample is from the type locality for the Rhodochrosite. 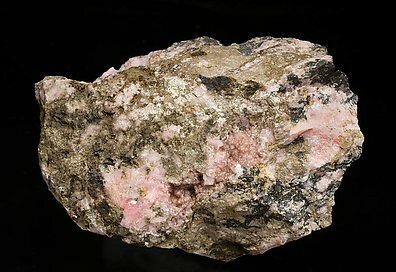 Botryoidal aggregate with spherulitic nucleus and concentric growths with very well defined color changes, from pale pink to intense red. 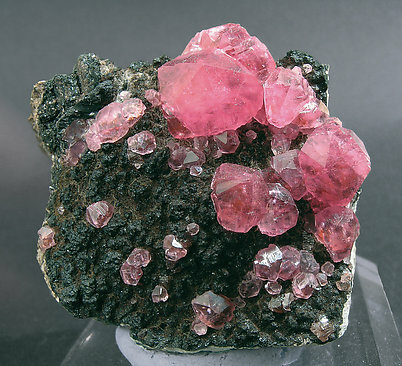 Floater twinned complete Rhodochrosite crystals that have a very flattened morphology, so typical at the Poudrette quarry. Aside from their deep and uniform color we note their transparency, not so usual with the Poudrette samples. 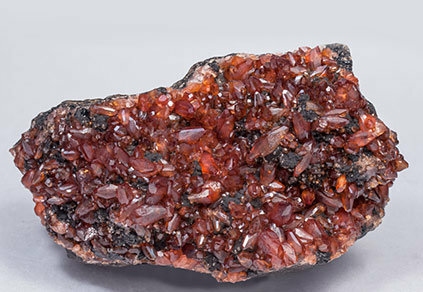 Very sharp, twinned rhombohedral crystals, one of them clearly dominant, bright and with a very intense deep color. This morphology, so well defined, is unusual with samples from Mont Saint-Hilaire. Aggregate of very sharp intergrown rhombohedral crystals, one of them clearly dominant and complete. They are bright and have a very intense deep color. 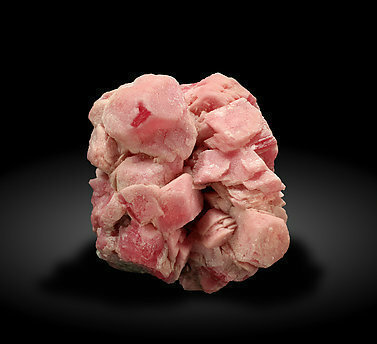 This morphology, so well defined, is unusual with samples from Mount-Saint- Hilaire. Tabular crystal with polycrystalline recrystallized areas. 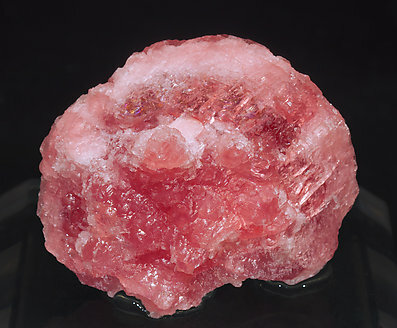 It has a pink color, variable in depth in different crystal areas, lighter on the edges and deeper and more intense at the center. With an unusual quality for this locality. Stalactitic growth with botryoidal forms at the narrow area and fluidal ones where it widens. A morphologic curiosity, unusual for the Capillitas mine. Aggregate of very acute scalenohedral crystals. 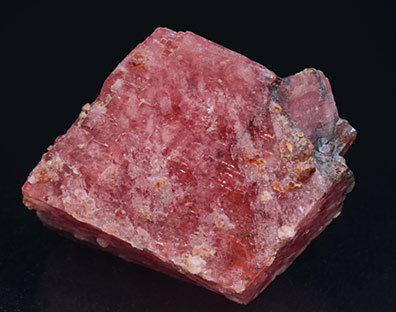 They are between transparent and translucent, with a color between red and mauve, very intense, deep and uniform, and are on a matrix of manganese oxides. A great classic although the locality is not well known for samples as fine as this one. 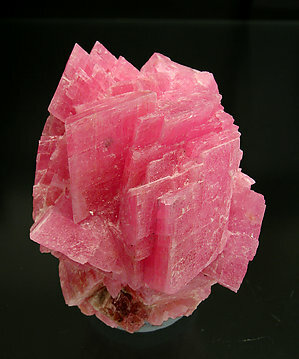 Small rhombohedral crystals of Rhodochrosite on matrix. 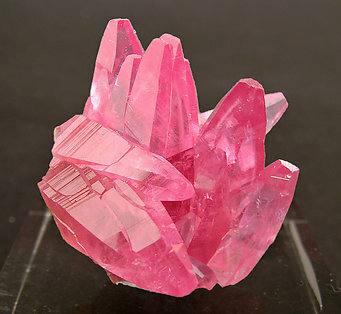 They have color zoning, intense pink in their centers and transparent near colorless transparent edges. 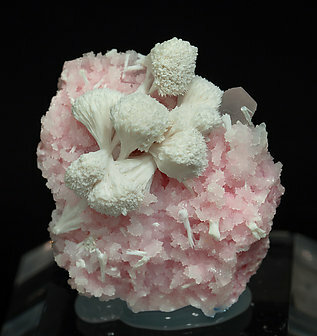 They are from a French locality uncommon in mineral collections. 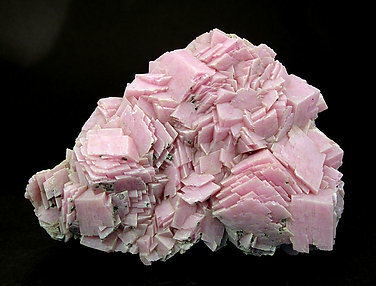 A fine group of subparallel growths of rhombohedral crystals with sharp edges and a soft and uniform pink color, with a little covering of Pyrite. 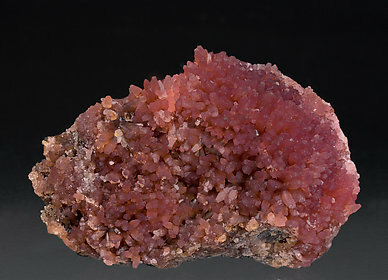 The specimen is from Butte, a classic locality from which, actually, it is now very difficult to obtain good samples. 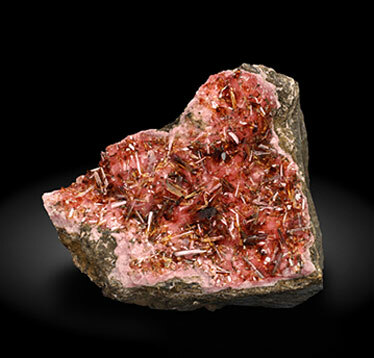 It comes with a label from Shaw's Mojave Desert Gem and Mineral Shop, Yermo, California. An attractive group from a very uncommon locality. 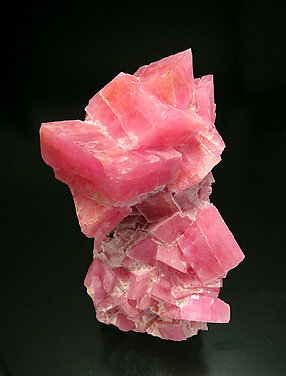 The Rhodochrosite forms columnar growths of a splendid pink color and silky luster. An attractive group from a very uncommon locality. 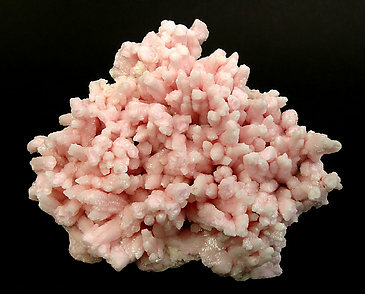 The Rhodochrosite form columnar growths of a splendid pink color and silky luster. An uncommon specimen for this locality. 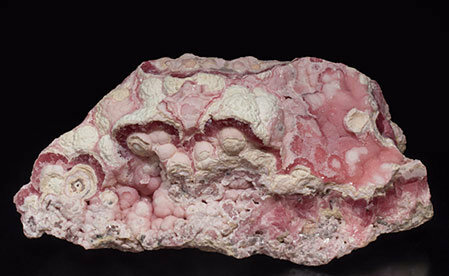 Botryoidal growths and not well defined Rhodochrosite crystals with an intense and deep color. 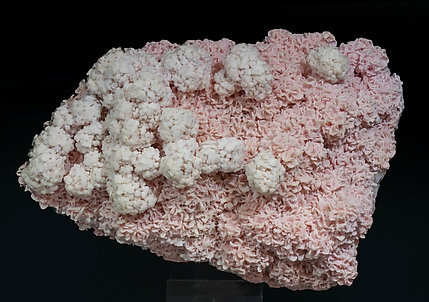 Complex aggregate with an excellent color, very intense and bright. On matrix with Sphalerite. This specimen is accompanied by the Siber+Siber label, from Zurich (Switzerland). The sample shows a perfectly polished surface that reveals concentric structures with a very deep color on the left, and crystalline and brecciated structures with a lighter color on the rest of the sample. The sample is with a label and the collection card that we'll send to the buyer. Vug, on a rocky matrix, filled by short prismatic crystals with flat rhombohedral terminations. 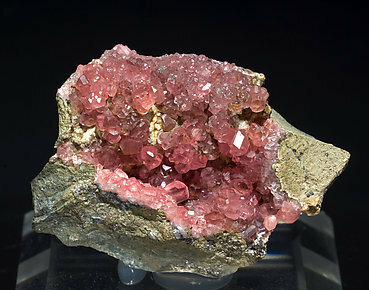 The crystals are transparent, bright, with very uniform color and have small, pale yellow, globular coatings, probably Smithsonite. 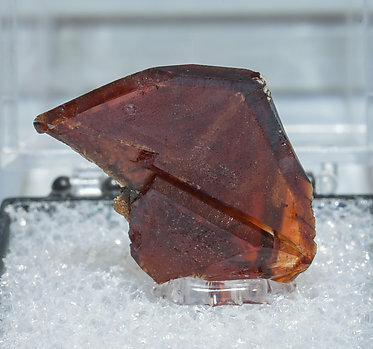 Crystals are rhombohedrons with very sharp faces and edges of a splendid size and we call your attention to its great color and the elegant disposition on matrix. Crystals are rhombohedrons with very sharp faces and edges of a splendid size and we call your attention to its great color and the elegant grouping. 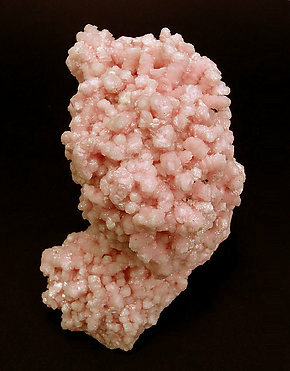 Clean, perfect Rhodochrosite, aerial crystals with very good contrast with their black manganese oxide matrix. 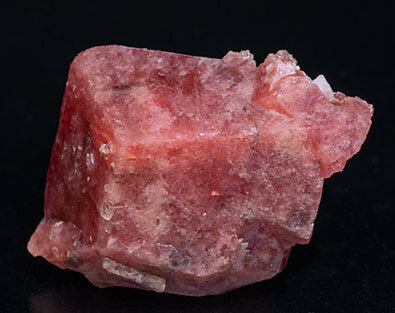 Aggregate of very acute scalenohedral crystals. 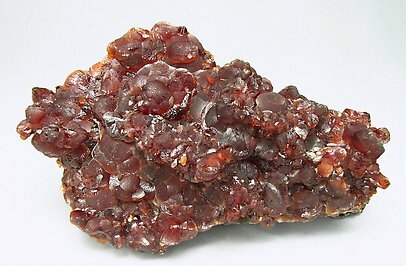 They are translucent, with a color between red and mauve, very intense, deep and uniform, and are on a matrix of manganese oxides. The locality is not well known for good collection samples. 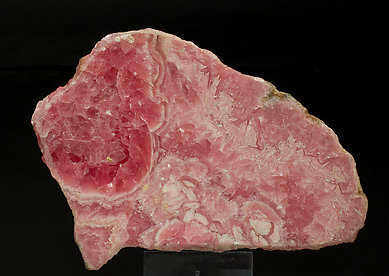 Druse of crystals that have an uncommon shape for Rhodochrosite, with very elongated prism faces and very flattened rhombohedral terminations. 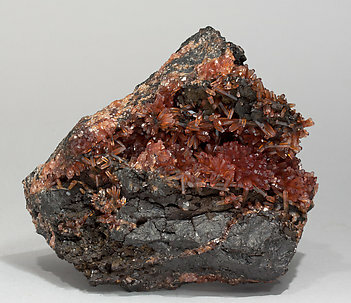 They have a very deep and intense color and are on a matrix of manganese oxides. A lost locality from which it is currently very difficult to obtain good samples. An excellent miniature. Crystals are scalenohedrons, clear and of a magnificent color. A classic.